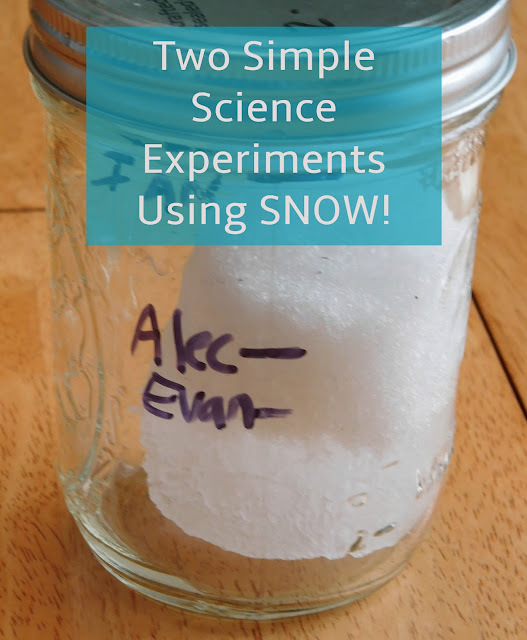 We had some snow and I figured there had to be a few quick science experiments we could throw together to learn more about snow. The boys and I decided on two experiments to try. First we wanted to see how much water was actually in the snow. We took a mason jar and packed it full of snow. We then each predicted how much water would be left in the jar after the snow melted. I wrote the predictions right on the jar using a sharpie marker. We kept the jar on the table and checked on it throughout the day. The boys could not get over just how little water there was in a jar of snow. For our second experiment we got a bowl full of water and the boys wanted to see if snow would float or sink. I knew this would be a great experiment since the older two boys were actually arguing about whether or not the snow would sink. We had a second bowl full of snow we put next to us and the boy experimented with putting light sprinklings of snow on the water, dropping in a snowball, or just picking up a large chunk of snow that was stuck together but was still pretty light and airy. While they all appeared to sink at first we found that the snow almost always had some small portion sticking just above or at the surface of the water. These are very cool experiments! I have so much respect for you as a homeschooling mom. I'm not sure I could have done it! Fun experiments - I remember the weatherman talking about the inch ratio between water and snow one time and I was amazed. It was quite fascinating and so incredibly simple. I love when inspiration hits.